Cake Poker is a great option for rakeback players due to its high 33% fixed rakeback percentage and acceptance of US players. However, the room is let down by primitive software (doesn't work with PT3, HEM or Mac computers) and tougher than average competition. Great room for rakeback + bonus. 33% rakeback, which is higher than most. Decent amount of traffic to work with, but not a crazy amount. Poor software and tight competition due to Cake being a popular room for rakeback grinders. The main reason why you would want to play at Cake Poker is for its handy 33% rakeback deal and the easy to clear $600 bonus. However, the presence of this rakeback deal and lower than average player traffic means that you will bump in to a fair number of tough grinders during your stay. If you can't get rakeback at Full Tilt, then Aced or Cake are your next best options for a rakeback poker room. I would personally go for Aced if you're after a long term room, but there is not much difference between the two overall. Alternatively, you could always think about taking advantage of a good valueback deal. Cake Poker competition and traffic. There are more tight players and fewer loose fish at Cake than at most rooms. You won't have any trouble finding a seat or multi-tabling at the lower stakes NL Texas Hold'em games. However, you will struggle to find a suitable variety of tables to play at as soon as you go past the $200NL stakes. The main problem with Cake Poker is that the rakeback deal attracts the sort of players who are most likely to be regular grinders, and are therefore very tricky to beat. There will always be a handful of poor players floating around the room, but the volume of these players is far lower than at rooms like PokerStars. It is possible to make money playing at Cake Poker, but you need to have very strong game and be able to use your table selection skills well to get the most from your sessions. It's not as horrible as I make it sound. It's okay to use. Not Poker Tracker 3, Holdem Manager or Mac compatible. Graphics are poor and there is not a great amount of features on offer. I've never encountered any problems with the Cake Poker software. It's always been fine to use, although it's far from being a poker client that is going to dazzle you with features and lightning fast response times. Unfortunately, the best thing I can say about the software is that it is average at best. What really lets the side down is the lack of Poker Tracker and Holdem Manager compatibility. 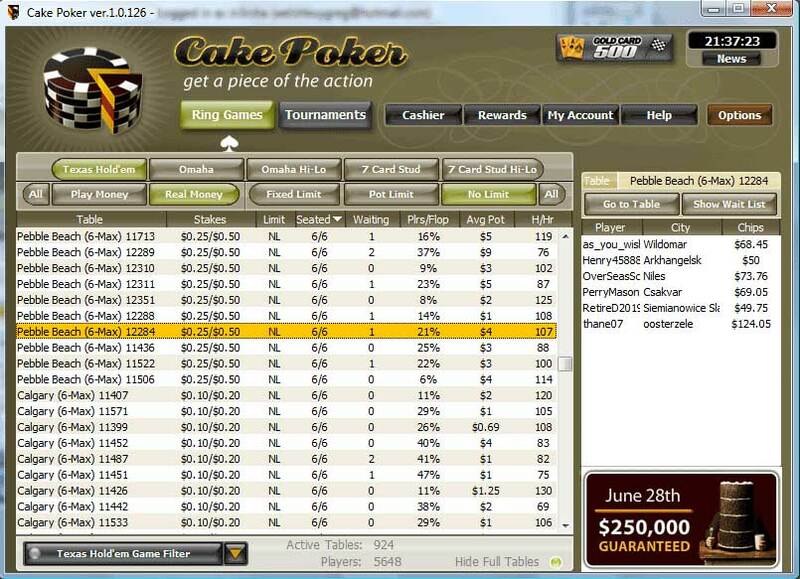 When you mix this with less than impressive graphics you can really start to see why the Cake Poker client is lagging behind other more popular online poker rooms. On a final positive note, the windows are easily resizeable and you can have more than 24 tables open at one time (if your computer can handle it). 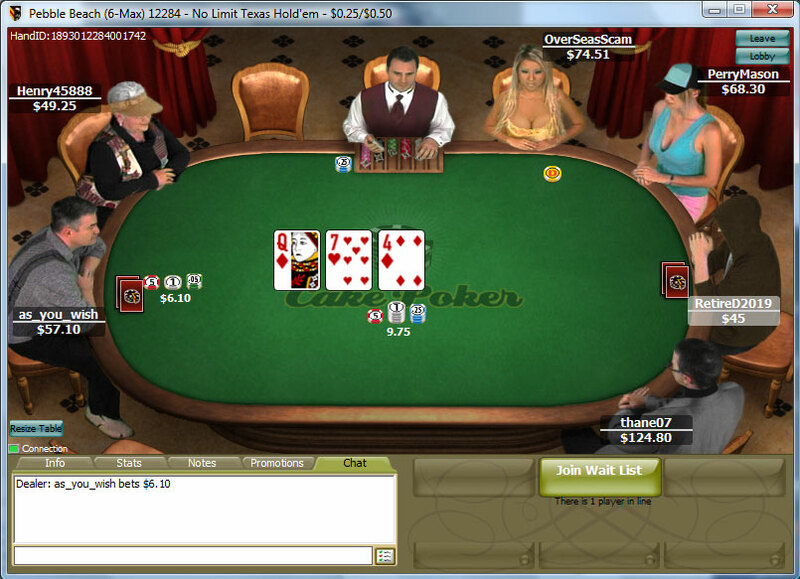 So Cake Poker doesn't lack in the multi-tabling department. Cake Poker offers a 110% up to $600 bonus to all new players at the poker room. No bonus code is needed, as the bonus is automatically given to all new players. Just make sure to enter the sign up code RAKEBANK when creating an account to get rakeback to go along with the automatic bonus. The Cake Poker bonus money is not deducted from rakeback calculations, which makes Cake Poker a very profitable poker room to play at during the bonus period. Check out the poker bonuses section to see how much rake you will be saving compared to other major rooms. On its own, the Cake Poker $600 bonus is actually a very attractive one. When you combine the bonus with a solid 33% rakeback deal, you stand to save a large amount of money that you would normally pay through rake during the bonus period. This means that Cake Poker is a very profitable room to play at whilst you clear the bonus (as highlighted on the poker bonuses page). I would go as far to say that the 33% rakeback + bonus just about makes up for the poor software and tighter competition at Cake Poker.